A miserable mid-September means it’s been nearly a fortnight since my last posting. Unsurprisingly I’ve been frustrated and anxious that this season would fizzle out way too soon. 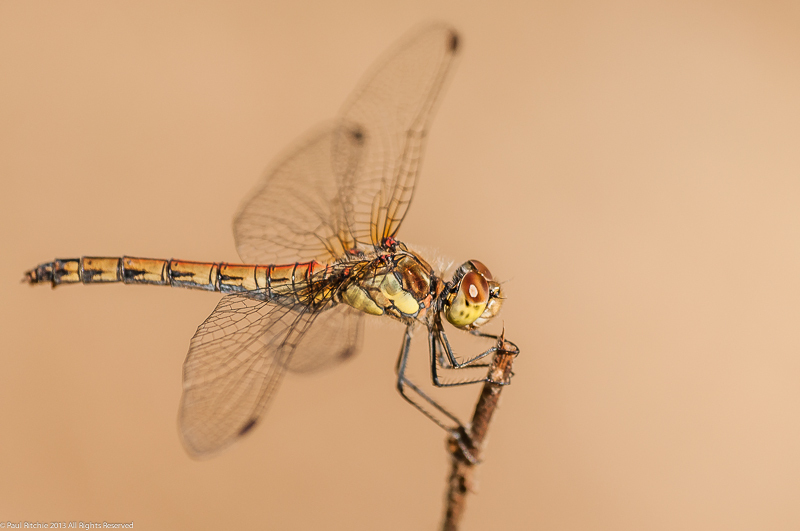 Many of the casual Odonata enthusiasts have already switched back to birds, and, except for accounts from abroad, the forums are looking very sad with everyone seemingly suffering the hangover from that marvelous summer. You might think that was to blame, but in reality September usually provides more than enough hawker entertainment to round the summer off. Certainly, for me at least, last season September was a glorious month spent mainly at the pond indulging in in-flight practice and enjoying a good turnout of species. I’d have thought the recent rains would have replenished the pond a little, but if anything it looks worse than my last visit at the end of August. The only water left is in the northern basin; filthy and stinking from daily pony, cattle and dog bathing, and the associated filth concentrated into a thick, satanic ooze Heston Blumenthal might have trouble recreating. 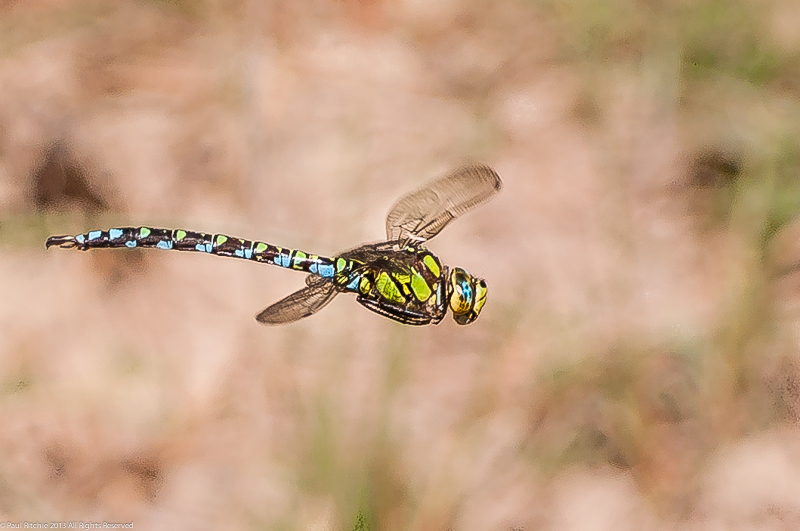 My heart sank at the sight, but was soon lifted by the sight of a patrolling male Southern Hawker, one of many encountered in my three hour visit. The sun had yet to burn off the remaining mist, so any attempts at in-flight photography was going to have to wait. 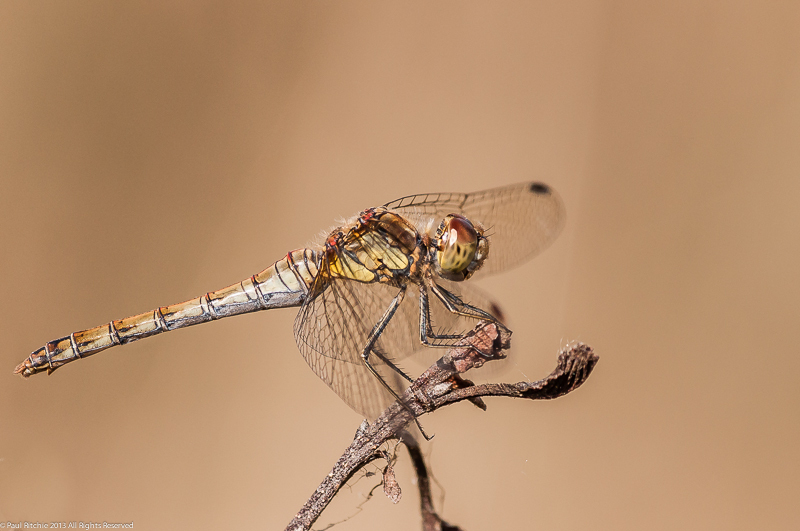 I did a tour of the thicket in the hope I might at least find some roosting Common Darters, but not one did I see – nor anything else for that matter. Back at the pond a couple of male Common Darters awoke along the edge of the island, joining the Southern weaving in and out of the reeded edge. 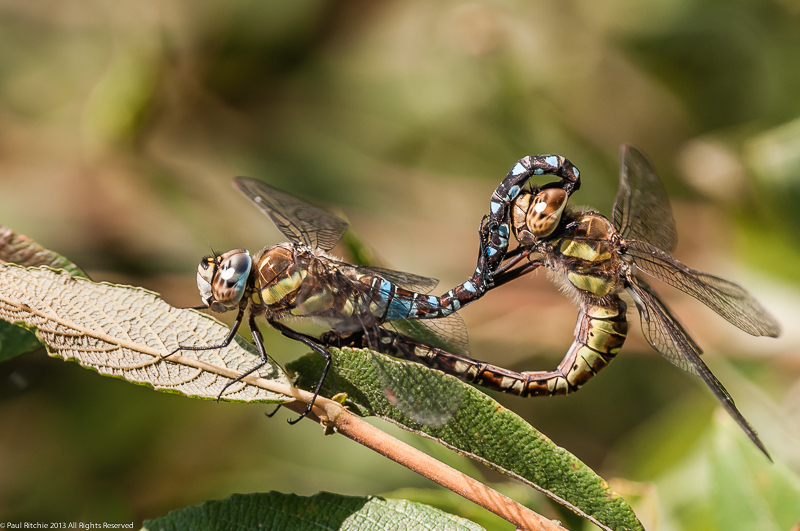 After a few false starts the sun finally broke through and suddenly the Southern Hawkers appeared as if from nowhere, clashing in dispute over who was having first dibs for a patrol. The original individual held his ground for a couple of battles until being chased off by a healthier looking specimen who was far more sociable. The problem I had was positioning. The only window available over the water which wasn’t at odds with the sun was almost knee deep, so I scouted around for another quarry. Luckily one had chosen to patrol a dry section at the eastern edge; the spot I usually prefer to choose when doing in-flighters. I relished in my time spent with the Southerns, a species I enjoy bonding with. I’ve missed their usual numbers this season, with only the odd one or two giving sport, so today’s tally of no less than six in residence gave me good reason to stay around. With a lull in activity due to some cloud cover, I did another scout of the thicket and this time struck lucky with a perched chance. Still no feeding or roosting damsels, Migrants or Common Darters, the latter at least showing a few more individuals on my return to the water. Surprisingly there were two male Southern patrolling one small muddy puddle, another couple in the other section and still my earlier quarry choosing his spot around the gorse bush – all at the same time, and seemingly content to share after the earlier battles. One of the more sociable individuals gave me my best background of the afternoon when he chose to fly low above the grass, offering some much-needed separation and – more importantly – perfectly lit by direct sunlight. At 3.30pm the clouds obscured the sun again and I felt satiated enough to move on, calling in briefly at Testwood Lakes to observe another male Southern patrolling the gully pond, a male Migrant at the far end of the path by the bird, and a female Southern seemingly about to rest up for the day along the upper path. I went out not expecting much and was pleasantly surprised, despite the lack of diversity. 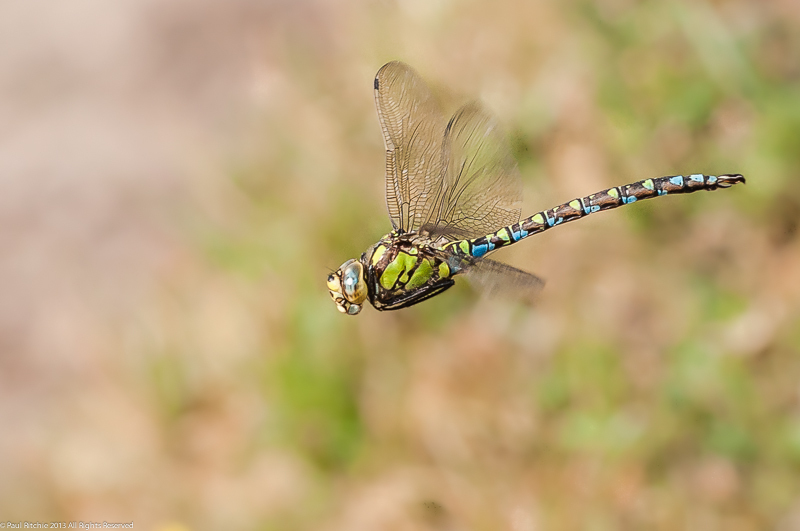 For me the chance to enjoy a decent showing of Southern Hawkers for once this year made my day. Mid September and another season which appears to have passed by far too quickly. 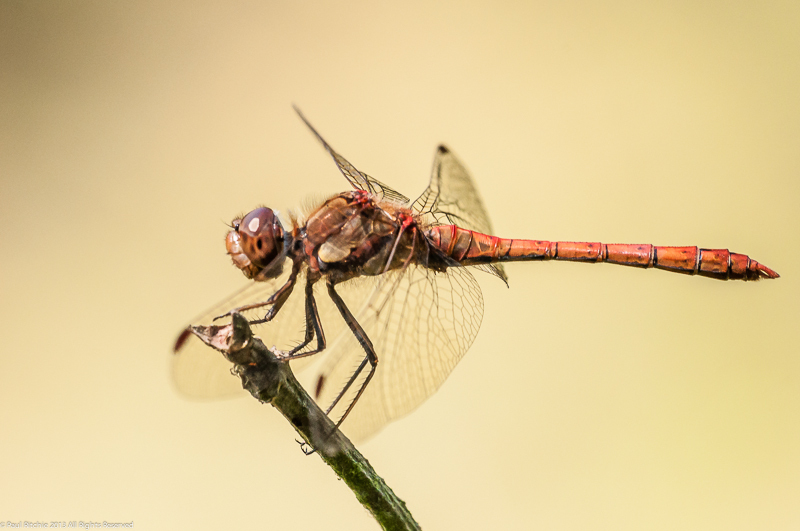 It doesn’t seem long at all since the first Large Red damselflies at Studland back in April, yet those glorious days of splendour at Ober Water seem like a distant memory. 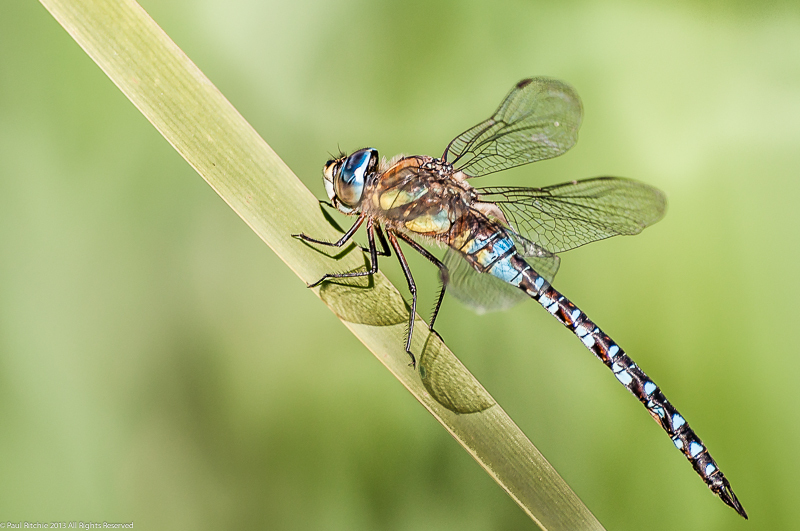 Although it’s my fifth season engrossed in dragonflies, the season’s end always catches me out either going out positively with some late wonders or fizzles out leaving you wondering quite what happened. Maybe it’s a little too soon to call time just yet…at least let’s wait until the end of the month before settling in to a long winter. There is promise of fair weather to end the month and hopefully this will provide a satisfying day or two to round off. I’m personally hoping that these prolonged periods of showers will raise the water levels sufficiently to spend a satisfying afternoon at the pond. Until then there are still a couple of other places which need to be visited this month, not least Badminston which was certainly a highlight last September. Taking advantage of a dry day with at least some sunshine, we called in on Thursday afternoon in the hope of bagging a few Ruddy Darters. Unfortunately this wasn’t to be. Not one encountered during our visit. Even Common Darters were noticeably few, with only a couple spotted by Sue and a male patrolling the corner section where we set up camp. 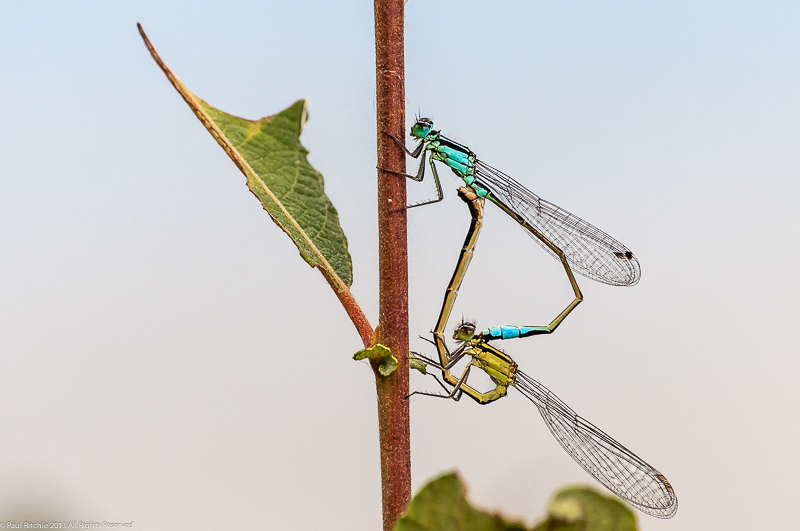 On a more positive note the Common Blue damselflies seemed to be doing well with good numbers along the track and several over water, some in tandem. There were even a few tenerals sheltering among the foliage. Hawker Alley at least lived up to its nickname with a Southern and several Migrants lining the path. Unexpectedly my first sightings were a mating pair. Unsurprisingly Migrants were the dominant species of the day with several pairings, a few ovipositing females and around half-a-dozen patrolling males. Certainly something to sink our teeth into, but in reality the numbers were way down on the same time last year. I had hoped for a session of in-flight practice, but this proved difficult to achieve with most of the potential subjects either patrolling low among the reeds or briefly flying into the open areas which by now were in shade. 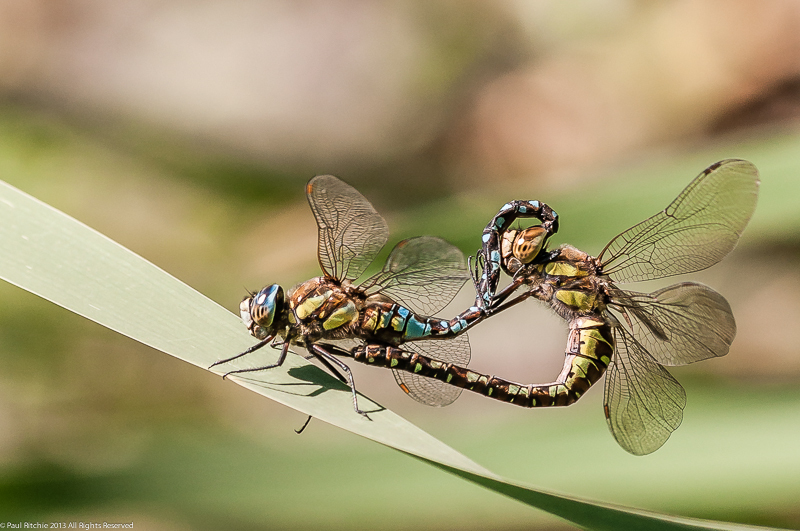 This left the mating pairs, who at least provided plenty of exercise pinning them down. Their preferred perches were in the bushes along the far back which were only accessible by wading in, offering the extra challenge of watching my footing while keeping an eye on my quarry. We did have a male Southern fly in a couple of times, inspect me briefly at close quarters before chasing off one of the male Migrants. Certainly not a playful individual. With increasing cloud, a noticeable drop in temperature and no further sunny spells, we called time, stopping briefly at Gang Warily pond where a decent number of Common Blue damselflies were in attendance. Attached to one of the gates was a planning notice from New Forest Council with ‘Major Development’ in brackets. This proposed development was a little vague, so I took a shot of the notice in order to do some further research when we arrived home. Our findings were surprisingly hopeful. Instead of finding our feared plans for a major housing development or other potential disaster, the proposal was for a major restoration of the workings to its previous agricultural usage and the gravel pits themselves to a permanent wetland habitat surrounded by acid grassland. Certainly the outlined maps look very promising. From what we can gather the restoration work will commence on the 20th of September, which should hopefully mean we will experience the results next season. 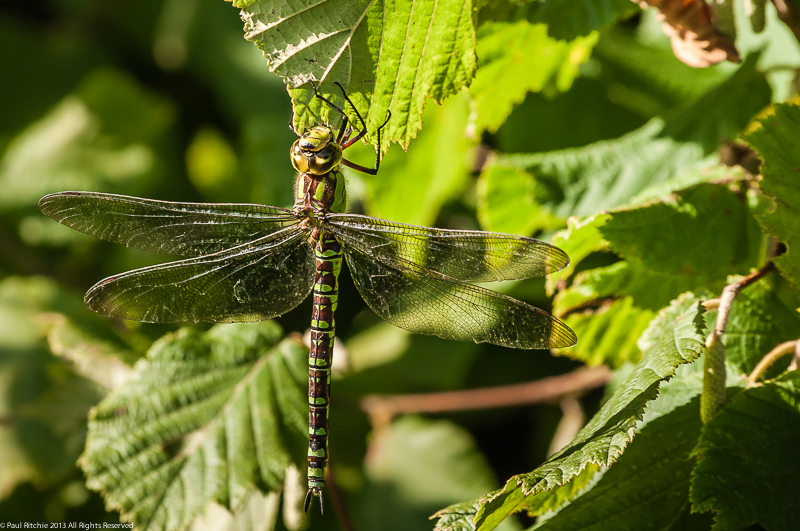 Doug and I had penciled in an afternoon at Ramsdown in the hope of blagging a hawker or two. 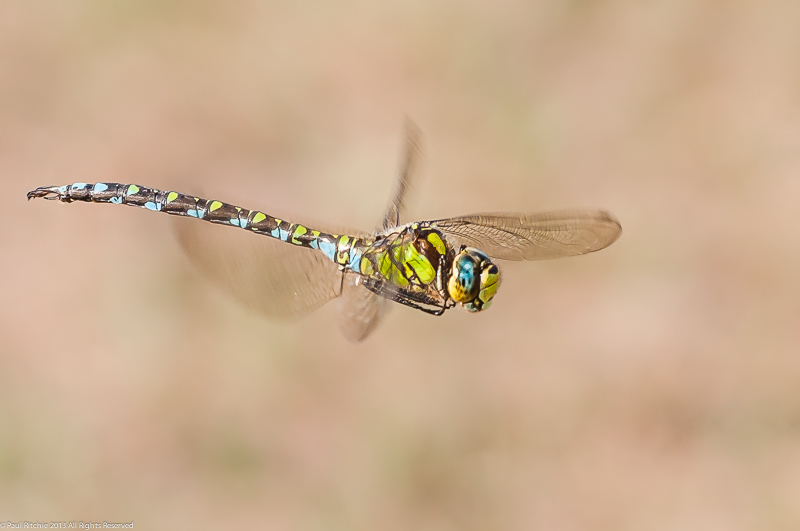 Any hawker would do, but an encounter with a Common Hawker would make my day. We didn’t expect to see any Browns, fearing they’re all but over, and if there are any still around they were likely to be rather worn and tatty. We met at the gate just prior to 1.00pm and walked down the track to the feeding area. On a good day you should expect to see something along the path, but not today. We’d had (much needed) heavy rain overnight and there was still a chill in the air when the predominantly blue sky was interrupted by one of the many scattered dark grey clouds. 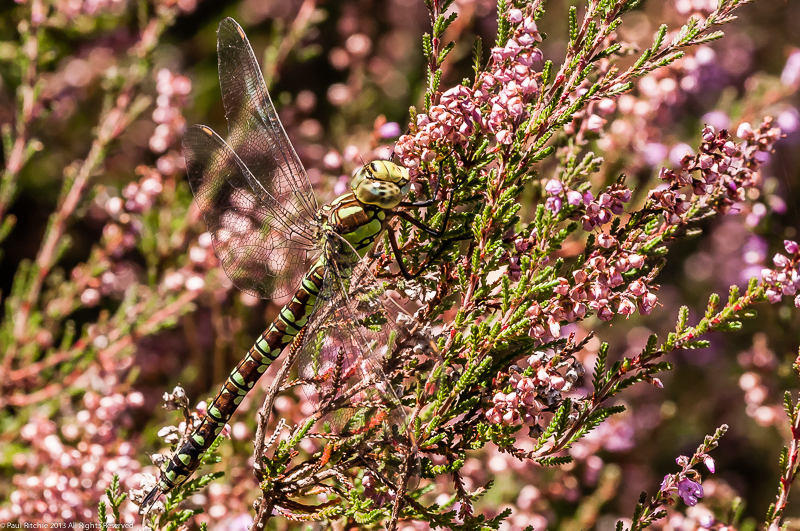 In the clearing were a couple of Common and Black Darters low down in the heather, and it wasn’t too long before we found our first flying Common Hawkers. We had two males patrolling the treeline, but not one of them landed in sight. 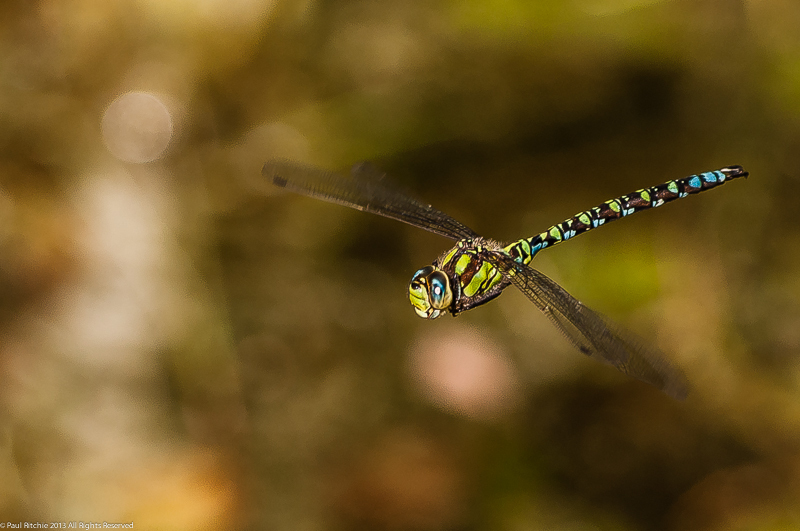 No matter, as we were soon rewarded with a female Southern Hawker. We also had a male Southern joining the Commons, but as we didn’t get another perched opportunity we made our way to the upper pond. Mostly inaccessible and deceptively deep, at least this pond still had a fair amount of water. I’m of the opinion this may be a floating pond on top of a very deep bog! Certainly it’s elevation almost guarantees a substantial depth, a hazard not worth getting wet for! The best position for observation and photography is unfortunately at odds with the direction of the sun, restricting you to to a small window to the right for any over-water action. 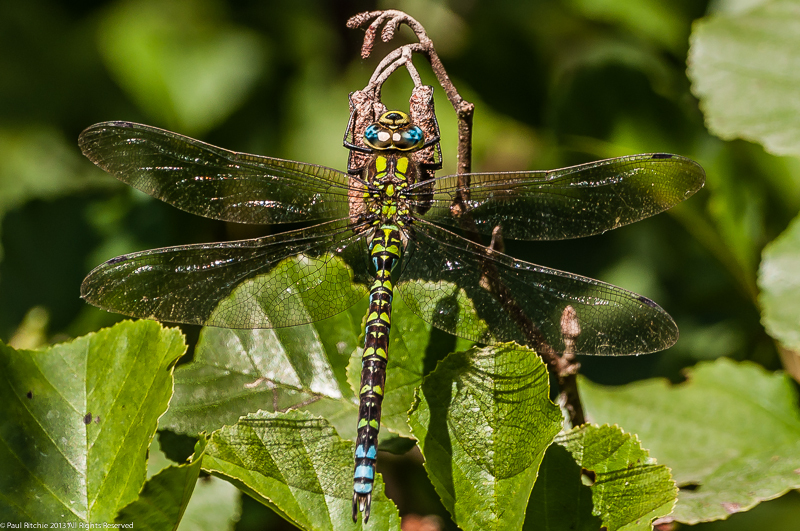 I didn’t have to wait long for a prize and I shouted for Doug to join me as a female Common Hawker was busy ovipositing in the overhangs of the bank. Typically nervous, she proved a little difficult to get close to, eventually preferring to continue her business far out of reach of anything other than full zoom. A welcome sighting which was improved further by the visit of a male scouring the bank. No photos this time as he didn’t choose to stay around long, especially once he found the female and took her over the treeline out of sight! 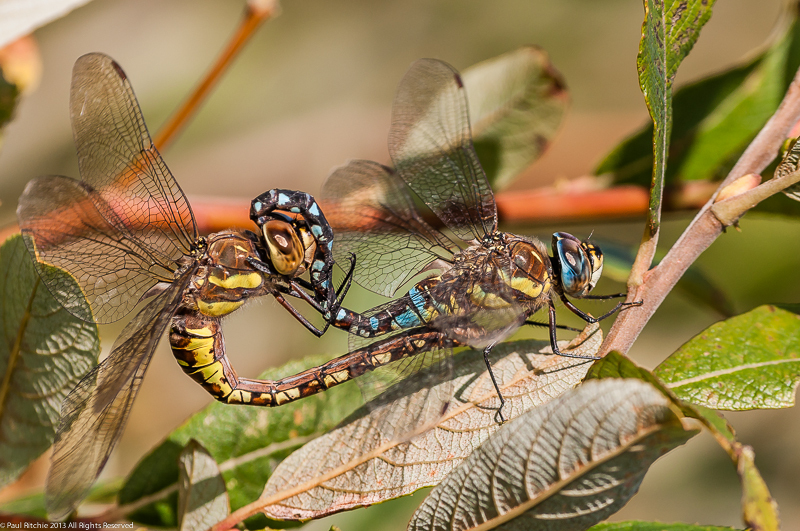 Thwarted once again, but a copped pair of Common Hawkers is worth waiting for. 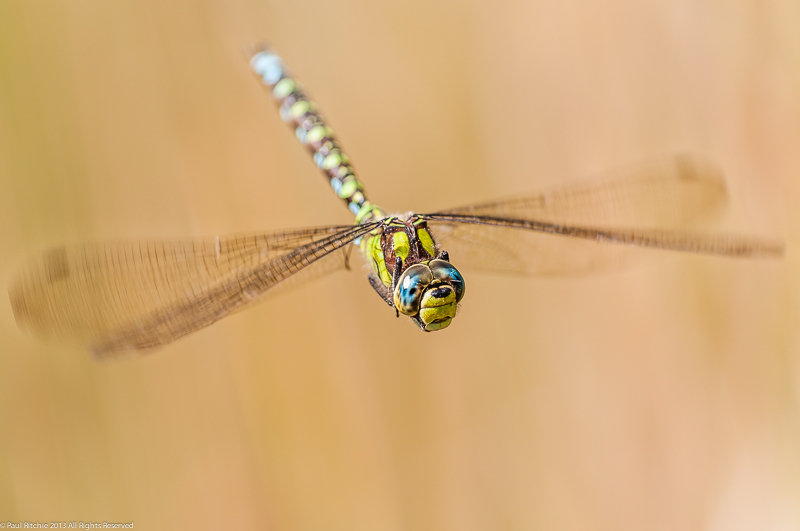 Robbed of both our subjects, we considered going back to the clearing but were soon interrupted by the welcome sight of a very friendly male Southern Hawker. So friendly he needed the macro lens, but worried he might disappear while I was changing lenses I persevered and at least managed a shot. After a short while he left too, and besides the odd Black Darter and Emerald Damselfly, the pond became very quiet. Back at the clearing we had another couple of sightings of a male Common Hawker and a hawking Migrant on the path back to the car, but again no perched opportunities so we decided to give Troublefield a try. No Migrants, or anything else except a few Common Darters along the first section, but a female Southern flew up ahead of us and continued into the other meadow. On reaching the meadow we had two or three male Southern patrolling small sections of the gloomy channel, and an brief appearance of a female. At least on our way back we had a male perched, albeit 3 metres up a tree. The north meadow was now host to the cattle, who had made walking with care a necessity! 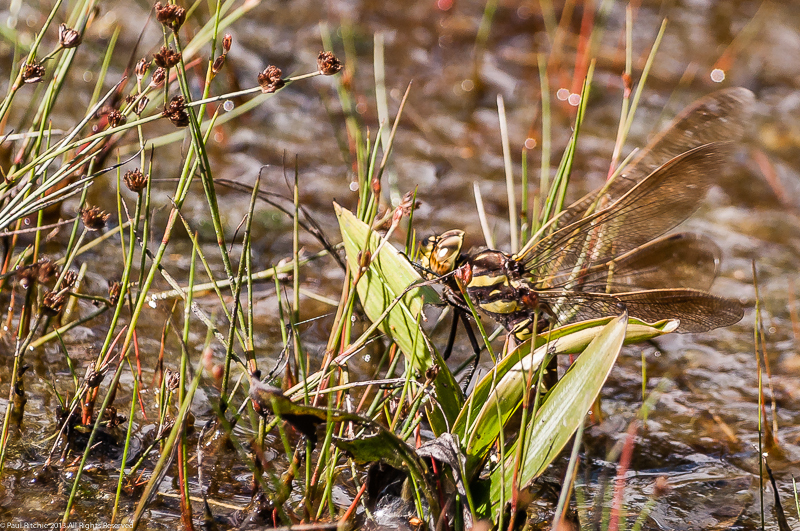 Their very presence meant we’d be lucky to find much, although we did have a brief sighting of a male and a female Southern and the inevitable Common Darters. So not many sightings, but what we did see certainly made the afternoon worthwhile. Another sunny day and another short jaunt to Swanwick just to see what we can find. We chose to arrive a little earlier to make the most of the sun’s position; at around 3.00pm the accessible stretch of the Centre Lake is thrown into shadow by the surrounding trees. A disappointing start, with only a few male Common Darters and a couple of Blue-tailed across the water, briefly joined by a male Migrant. The pontoon was even worse; no resident hawker here, and the CD’s were manically darting far from shore. Returning to our initial position saw a male Migrant disturb a mating pair, who allowed a shot or two before rising up into the trees. Now we’ve started. Another check on the pontoon revealed nothing new so we headed towards Tom’s Lake. I don’t know why chose to go around the other way, call it a hunch which paid off with the first ‘fishing peg’ hosting a male Southern. Grand job, or it would have been if it wasn’t facing into the sun! A combination of back light, tree shadow and the fact he wouldn’t face me prevented me from grabbing a shot this time. Our circuit of the lake was rather uneventful with only the inevitable CD’s popping up here and there. Much better to grab a few of those in the meadow or along the path where they were feeding. That Southern had me fired up, so we returned to the peg and I swapped lenses to the macro, as the only decent opportunities were when he was circling us – far too close and quick for the zoom. I tracked his chosen path and waited until the perfect opportunity arrived, but worried in case I couldn’t get him all in. He was that close! After scouring the meadow for yet more CD’s we returned to the Centre Lake just in time to witness another Migrant pairing. I finished the day off with a male Migrant perched on one of the reeds, one of three patrolling this corner of the Centre Lake. On Thursday we returned to Swanwick to make use of the one sunny day left before the welcome rain set in. As soon as we arrived a pair of Migrants rose into the trees, but besides only a few Common Darters and Blue-tailed patrolling the Centre Lake.I settled for a perched male Migrant before moving on. The grassy knoll was looking rather sad butterfly-wise compared to a week ago, with only one rather tatty Clouded Yellow joining a few Small White and even tattier Common Blue. 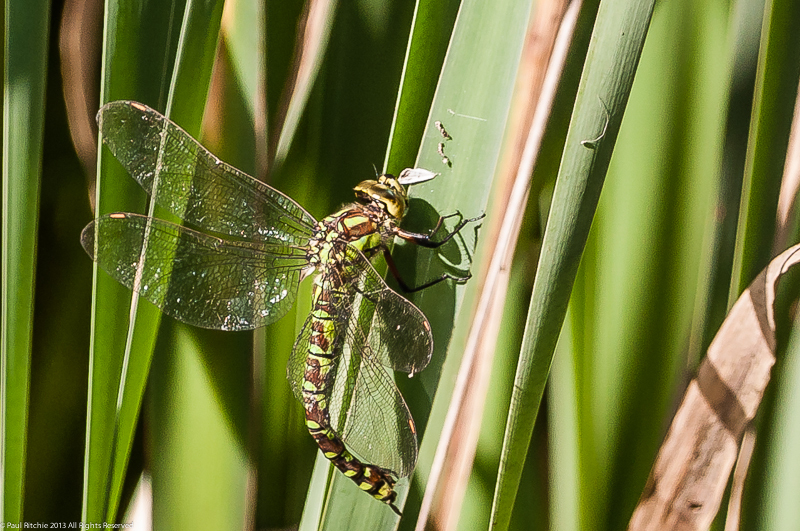 The resident Southern Hawker wasn’t at his post on the fishing lake today, just a few Common Darters and Blue-tailed Damsels decorating the surface. 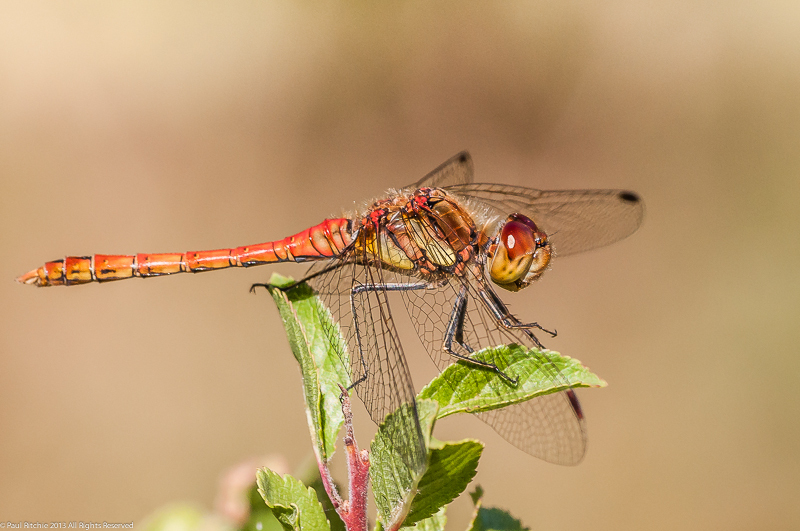 A walk along the back paths revealed the usual roosting and feeding Common Darters, which kept me busy for a while. I stood and watched a male Southern hawking around a small clearing, relentlessly taking small insects on the wing and never tiring over a course of 20 minutes. 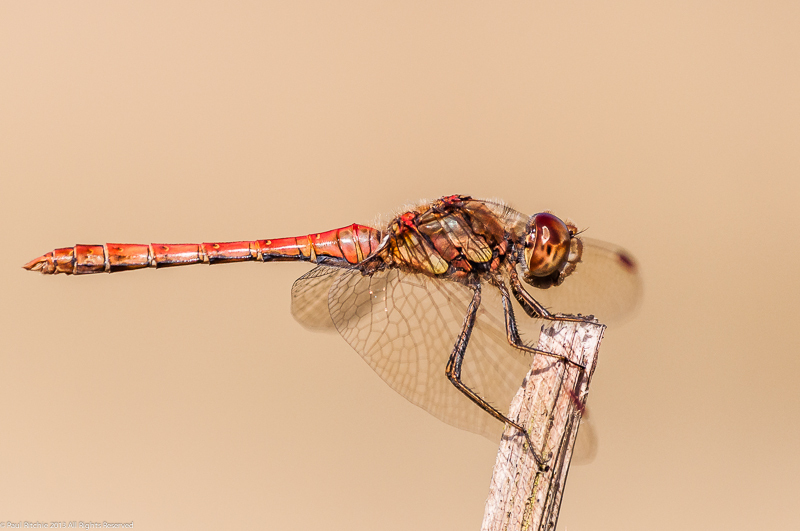 Returning over the grassy knoll a female Common Darter posed perfectly, if not ideally on the focal plane. Back at the Centre Lake we sat on the bench watching three or four Migrants hawking around the trees. Down on the shore line a male Southern flew in briefly to disturb the couple of resident Migrants and in the dipping pond my passing spooked a female Migrant while she was ovipositing. Luckily she chose to perch further up the reeds for my last opportunity of the day. This season I’ve visited Swanwick more often than in previous years, writing it off as merely average with little diversity. I’ve changed my opinion after grabbing my first Downy earlier in the season, filling up on Blue-tailed a few weeks later and having a rather successful series of visits over the past two or three weeks. It’s certainly not a case of shooting fish in a barrel, but a little patience and perseverance will reveal some quite wonderful moments. I’ve made a mental note to visit at least once a week during the season from now on. Right about now I should be able to spend a few hours at a favourite pond appreciating the delights and wrapped up in a little in-flight photography, but all of my favourite small ponds are either non-existent or nothing more than muddy puddles. Where to go then? On Monday I fancied something a little different, so Sue & I decided to blag our way around Broadlands Lake again to see what was about. It has been 4 years since we last had a look. Broadlands Lake is a private fishing lake within in the extensive grounds of Broadlands Estate and is a popular spot for course fishing despite being next to the M27 motorway and its associated noise. 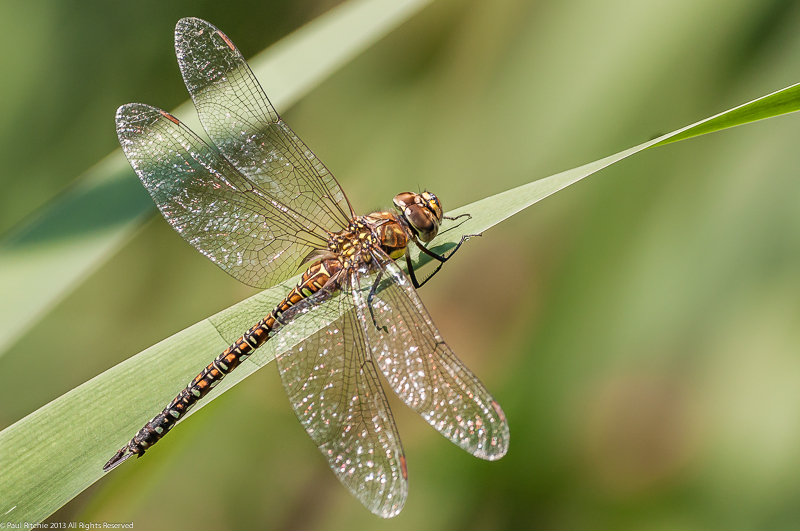 Now fishing lakes are never a good spot for dragonflies – too much underwater competition – but close proximity of the New Forest and Testwood meant there should at least be something there to grab your interest. 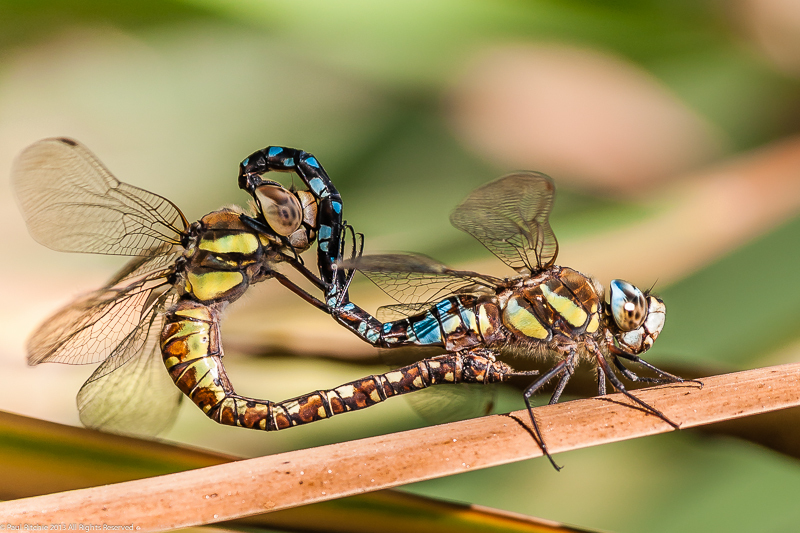 There was, in the form of a dozen or so Migrant Hawkers either holding single territories or time-sharing others. 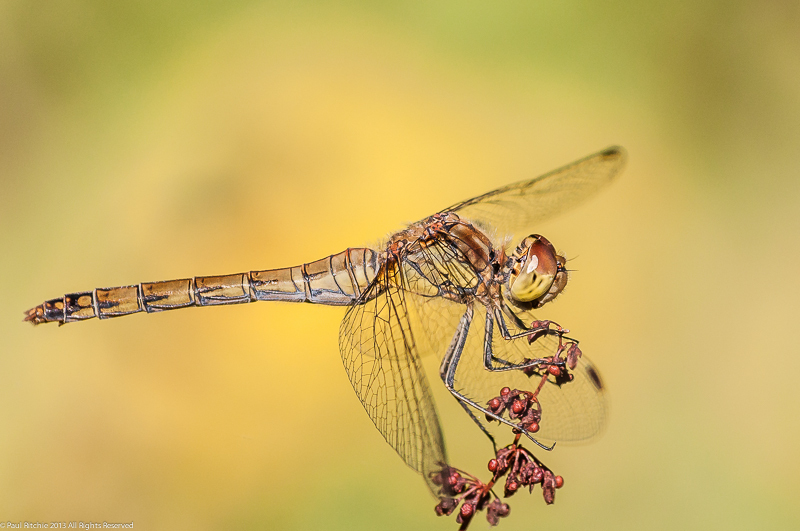 I was surprised at the lack of Common Darters with only a few seen during our visit. 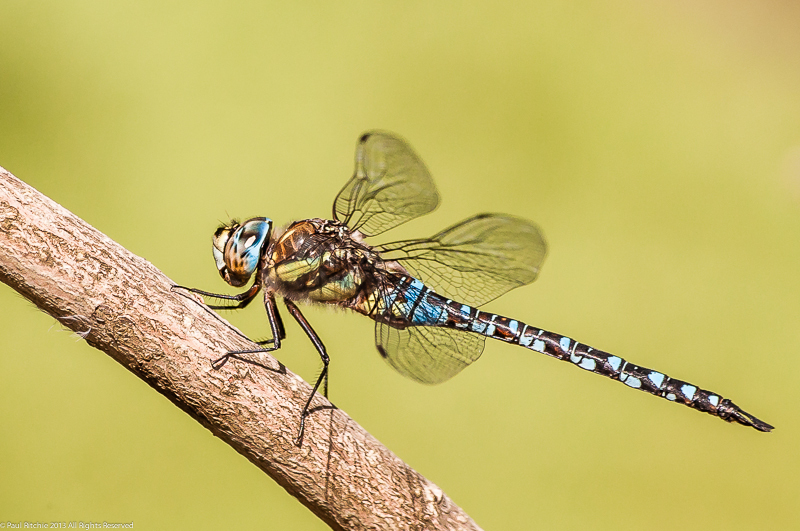 At least there were a few Blue-tailed Damselflies still holding their own. Curiosity sated for another 4 years, we took the back way in to Testwood Lakes in the hope of connecting with a Southern Hawker. 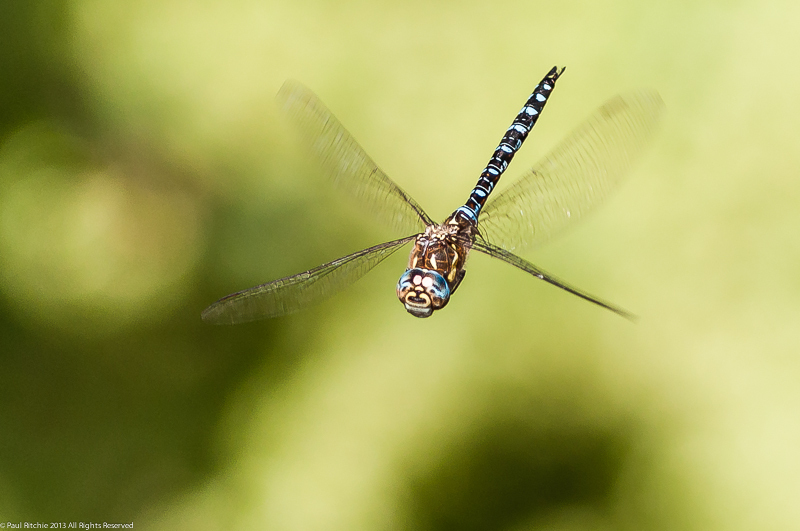 Sure enough at the gully pond there was a male patrolling, flitting in and out of the reeds and frustratingly choosing the dark, shadowy areas making an in-flighter almost impossible. There were a few Migrant perched towards the back of the pond, occasionally flying up to intercept the Southern if he flew too close. As I was sat on the boardwalk attempting this, a female came in and landed on the side of my right knee and attempted to oviposit in my trouser material. I watched helplessly as the male saw her and took her up high into the oak to rob me of all opportunities. 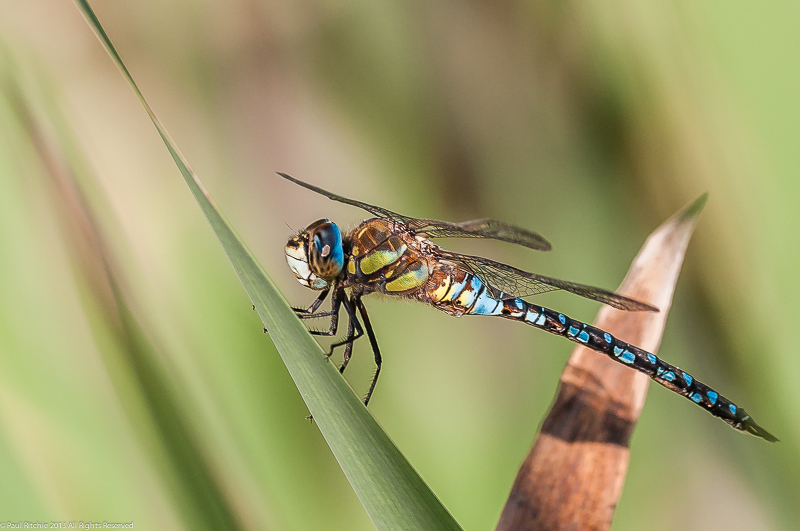 We continued along the path towards the bird hides where another 3 Migrant were feeding near the round house and another at the far end before returning to the pond where no less than 3 Southern Hawkers were now time-sharing small territories while the female was ovipositing in the reeds. I bedded in and did my best to avoid the shadows and attempt to capture one of the males before calling it a day. On Saturday 31st we once again visited Swanwick to experience a chance of over-water activity – something we were unlikely to get at Cadnam or one of the other ponds this side of the New Forest to to the drought conditions. 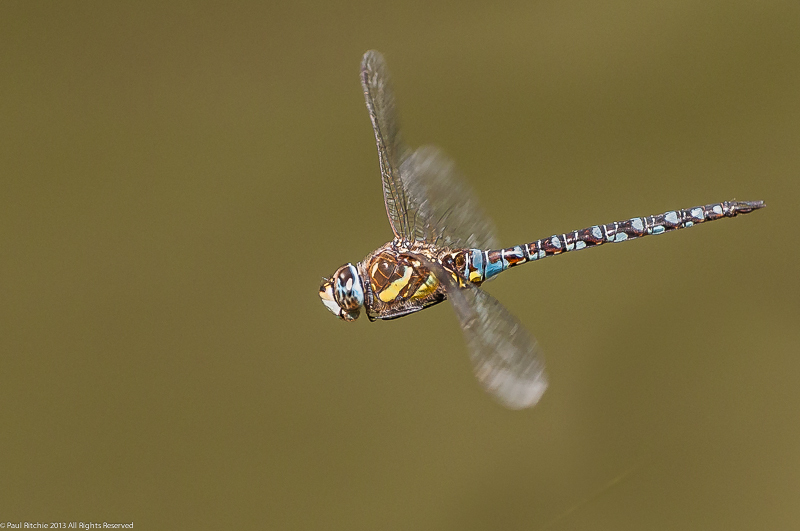 The Centre Lake had the usual Common Darters, an Emperor and a couple of Migrants in attendance, ideal for practicing some in-flight shots. My subject chose the small enclosed area inside the pontoon for his territory and thankfully landed on a convenient branch. A little positioning allowed a pleasing background of the surface moss. This time we chose to walk along the less used paths along the lakes’ shoreline, in places overgrown through lack of use. There wasn’t much going on except for the odd Common Blue damselfly and reliably scattered Common Darters. At the small pond/watering hole at the far end a Southern Hawker was still holding court over the disgusting brown water. A little perseverance and positioning paid off with another in-flighter to add to the collection. 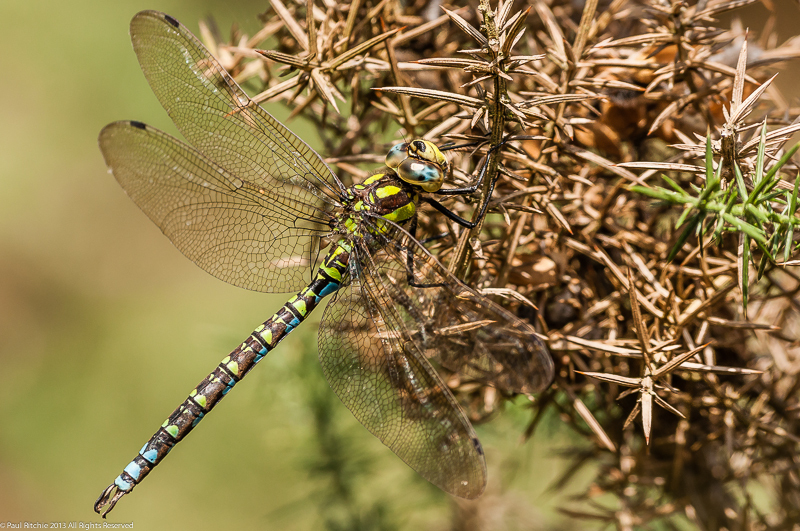 The return paths threw up a profusion of Common Darters and the odd feeding Migrant Hawker while the meadows still had a few Clouded Yellow butterflies to enjoy along with ever-decreasing numbers of Common Blue and Small White. Although it would’ve been nice to find a perched Southern Hawker, at least those ever-present Common Darters allowed good practice. 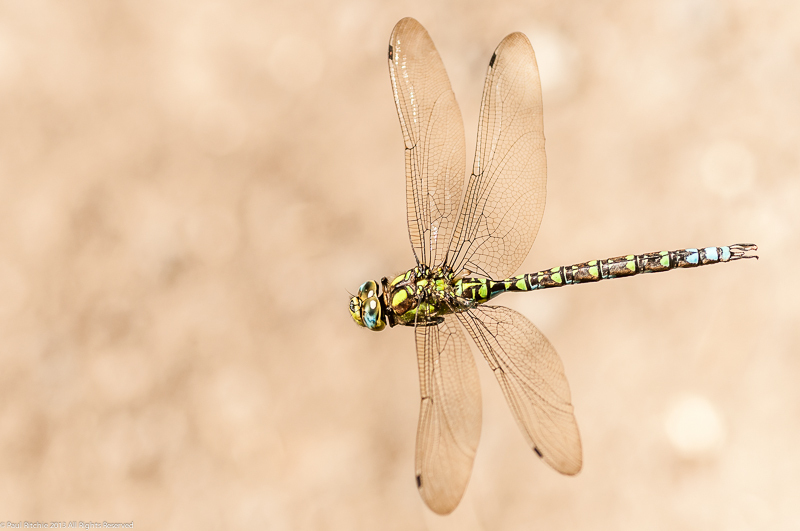 Every year I hear the same old ‘not another Common Darter’, but in the absence of anything else they do at least provide perfect opportunities for photography practice with just a little shift to the right or left altering the whole outcome. We should be thankful for these opportunities as in another month or so we’ll be heading towards another 6 month stretch when the welcome sight of a Large Red will get our juices flowing again. On a more positive note we still have September to enjoy!